Packing lunch for your children during a busy school year can be a stressful endeavor. Sometimes, you pre-pack the night before to ensure you don’t forget anything. Other times, you’re left scrambling to get everything in order. After a while, though, packing your child’s lunch becomes yet another routine. While you may change up the variety of foods on offer, the arrangement of food itself remains relatively unchanged. If you have the time, and are looking to add a fun twist to your kid’s school lunches, you should try incorporating Tetris. We already know that Tetris is the perfect game when it comes to organizing everything and anything in your life. The same can be said of packing a lunch. Each food item is its own Tetrimino, and the lunch box itself is the Matrix. While packing lunch the Tetris way can help make things more efficient, why stop there? If your child isn’t a huge fan of crust on their sandwich, try cutting their sandwich into Tetrimino shapes. In addition to your child’s sandwich, there are other food items that can easily be transformed into miniature Tetriminos. For example, fruits, veggies, tater tots, small slices of cheese, jello, and cookies. In fact, baking Tetris cookies is much easier than you might think! We have a guide on creating your very own Tetrimino cookies, as well as another guide on making Tetris Jell-O. By adding familiar shapes to your child’s food, you’ll be able to help make their lunch break less monotonous. You can even involve your children in the process by having them make suggestions as to what they want to see. Maybe they want an L-Tetrimino made entirely out of grapes? If so, grab 2 toothpicks and use them to spear your grapes into an L-Tetrimino. Perhaps it’s their birthday and they want pancakes for lunch? Make them some delicious Tetrimino pancakes! You can take things even further by trying your hand at a bento-style lunch. What is a bento? A bento is a Japanese style lunchbox separated into various different sections, each catering to their own single portion food. What’s notable about bento boxes is how many of them are themed, with food presented in character shapes. You can create animal shapes, or even a full Tetris Matrix! Looking for visual ideas? There are plenty of websites that feature easy-to-make bento boxes. Ready to dabble with a Tetris bento? We suggest setting aside enough time, perhaps over the weekend, to familiarize yourself with bento-style lunches. Need a suitable lunch box? Click here to buy one from our Tetris Shop! After that, creating bento boxes is akin to Tetris. With enough practice, you’ll soon become a master! Over time, you may be surprised to find that packing your child their lunch has become fun and engaging. While the school year can certainly be stressful for both you and your child, adding a little positivity to their lunch can certainly help the day go by smoother. 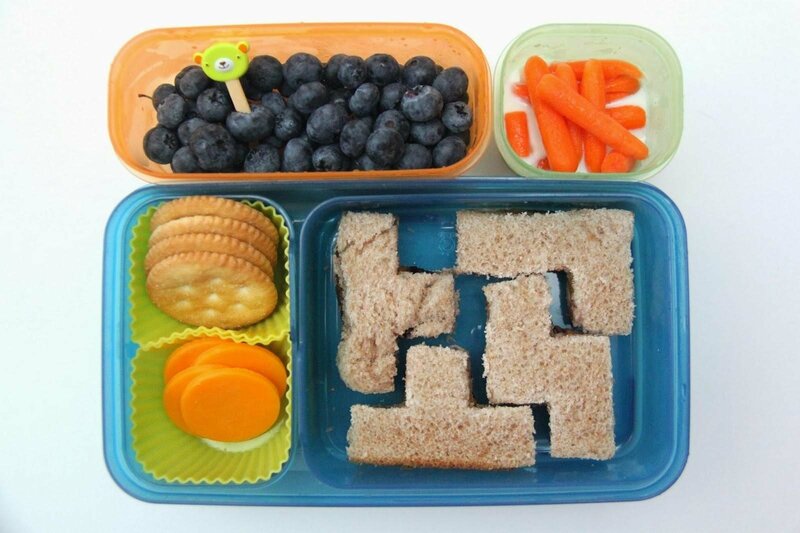 So, how will you add a little Tetris flair to your child’s lunch? The possibilities are endless! Set aside some time, get creative, and marvel at all the cool designs you come up with. Need a little motivation? Play Tetris for free right here on our website to get all those creative juices flowing!